An Indian epic sports-drama, Lagaan became the third Indian film to be nominated for the Academy Award for Best Foreign Language Film after Mother India (1957) and Salaam Bombay! (1988), making this poster highly collectible! 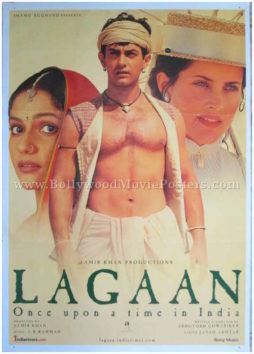 Printed and circulated somewhere during the original first release of the film in 2001, this Lagaan movie poster was printed for publicity of the film but never ended up being used. 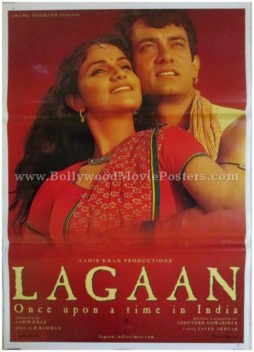 Superstar Aamir Khan and Gracy Singh are seen in a romantic pose in this glossy Lagaan movie poster. A deep red background adds a striking touch to this Lagaan movie poster. A line at the bottom “Once upon a time in India” gives away the period setting of the film. The highly acclaimed soundtrack of Lagaan was composed by A.R. Rahman with lyrics by Javed Akhtar. Held as one of A.R. Rahman’s finest compositions, the soundtrack became a rage throughout the nation upon its release. Songs like “Mitwa” and “Chale Chalo” are fondly remembered and played till today. 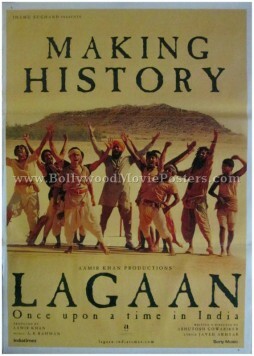 Old Bollywood poster of the cult Hindi film, Lagaan (2001) for sale. Printed and circulated somewhere during the original first release of the film in 2001, this Lagaan poster was printed for publicity of the film but never ended up being used. Superstar Aamir Khan is seen prominently at the center of this glossy Lagaan poster. He is flanked by Gracy Singh on one side and British actress Rachel Shelley on the other. A line at the bottom written in Devanagari Hindi script gives away the period setting of the film. Classic Bollywood poster of the cult Hindi film, Lagaan (2001) for sale. Superstar Aamir Khan and British actor Paul Blackthorne are seen prominently in this glossy Lagaan movie poster. 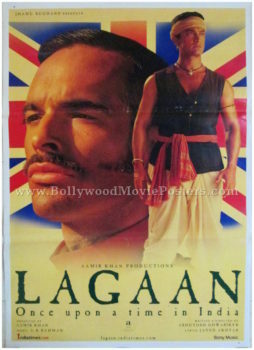 The Union Jack is seen in the background of this Lagaan movie poster. A line at the bottom “Once upon a time in India” gives away the period setting of the film. Original Bollywood poster of the cult Hindi film, Lagaan (2001) for sale. Key players comprising the cricket team led by captain Aamir Khan are seen prominently in this glossy Lagaan movie poster. The title on the top of the poster reads “Making History.” A line at the bottom “Once upon a time in India” gives away the period setting of the film.